Serve these little parcels as an appetizer or as a main dish with dirty rice, hot French bread, and a salad. Oh, and don’t forget a cold beverage to put the fire out! 1. Butterfly shrimp (cut along the back but not straight through) to make room to insert a slice of jalapeño. Put them in the fridge to keep them cold while you prepare the bacon. 2. Cut the bacon strips in half and cook to medium either in pan, oven, or in microwave (Cooking time depends on method of cooking and heat setting). You want them about half cooked so they are still flimsy. They will finish cooking once on the grill. 3. Once bacon is cooked to medium, drain on paper towels. Insert one slice of jalapeno pepper (Use the jar kind and remove the seeds to make them milder, if desired) into the center of the back of the shrimp. Close shrimp around pepper and wrap the shrimp with one piece of bacon. You will usually have a small bit of shrimp sticking out at the top and the tail sticking out at the bottom. Secure the bacon, shrimp, and pepper together by inserting a toothpick so that you have gone right through from one side of the shrimp to the other. 4. Cook the shrimp on a medium-hot barbecue grill or gas grill, turning once or twice after 2 or 3 minutes. 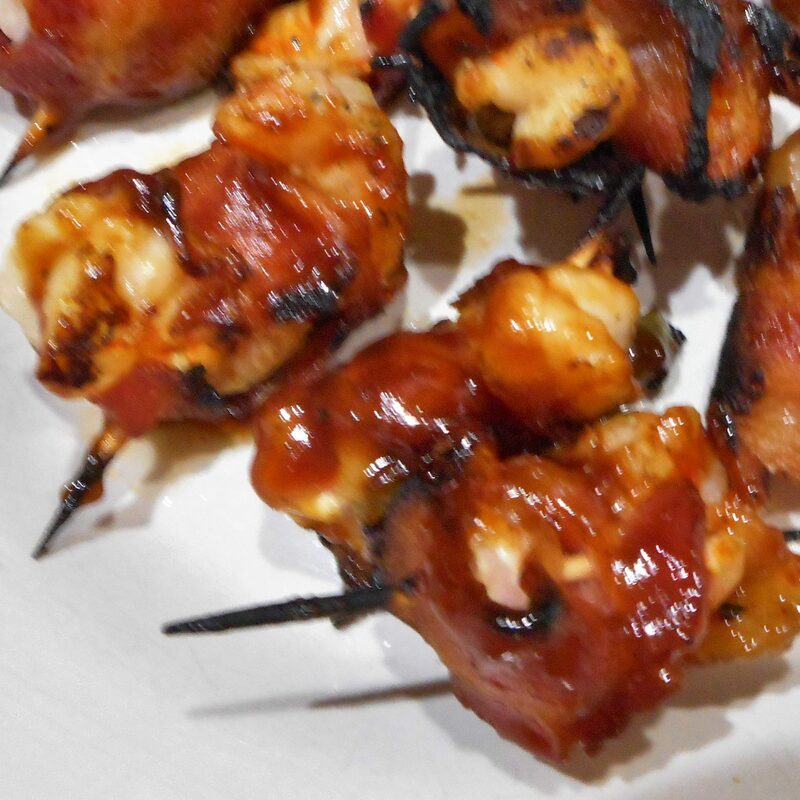 Once they have been turned and partially cooked on each side, baste in a nice smoky BBQ sauce and cook on each side for a further 2 to 3 minutes (or until both bacon and shrimp are fully cooked). 5. For those who do not like spice, leave the jalapeños out or just use a tiny piece of a slice.